Edited 5/14/09: Welcome from Kelly's Korner, Show Us Where You Live Friday! Back in November, I blogged about our new house and gave a grand tour of every room. 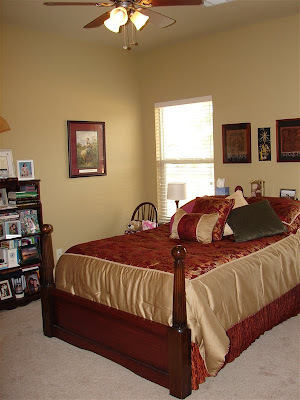 This week on Show Us Where You Live Friday is guest rooms. Currently, we don't have a guest room. My mother-in-law is living with us now. When she is no longer with us, we will turn her room into our guest room. So, for now, I will show you Nana's room. She has her own private bath - perfect for guests and mother-in-laws! I hope you enjoy and hopefully I'll see you back here next week. Wow...Part 6! Lots of house to show you!! Today we're going to take a look at Nana's suite. Remember the arched doorway by the cabinets in the kitchen? Go through that archway and turn right and you enter into Nana's bedroom. This side of the house has the long hallway. 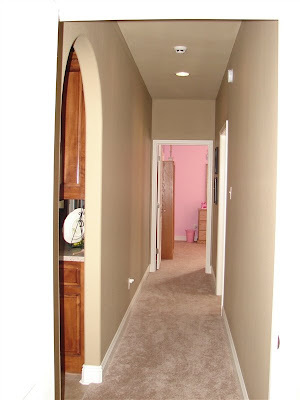 Here is a view down the hallway, standing in Rachel's doorway, looking down and into Nana's bedroom. 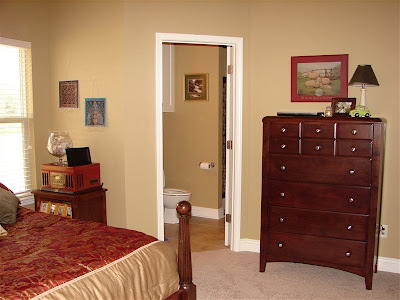 The door on the left goes into Rebekah's bedroom. Here is what you see as you enter into Nana's bedroom. Isn't her bed just gorgeous? She gets more compliments on it. We found it at Target! Love that place. Nana's bed is centered between two windows that look out into the backyard. Another view from another angle. 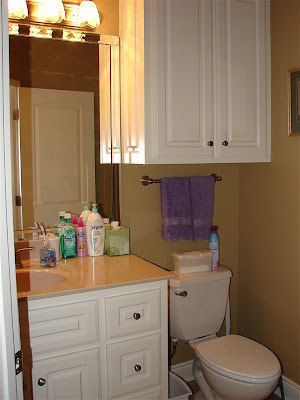 Here you can see into Nana's private bathroom. 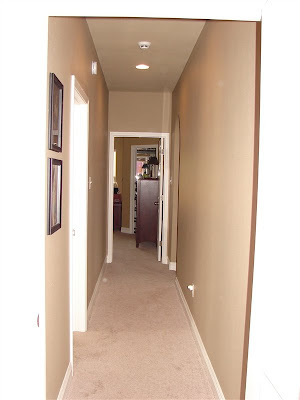 And yet another view, you can see back to her doorway that leads to the hallway. 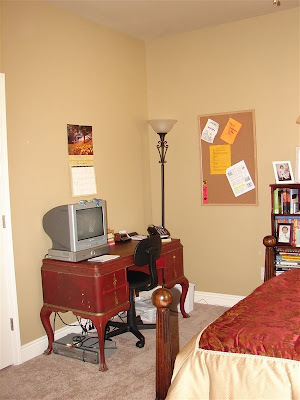 You can't really see it in any of the pictures, but her closet is just to the right of the "Home" picture in the photo below. And a fourth view. The desk she is using used to belong to my Dandy (my grandmother). It's a true antique and needs a little TLC, but still holding strong. I love the red color. On the far left, you can see the edge of her closet door. Here we are entering into her private bathroom. 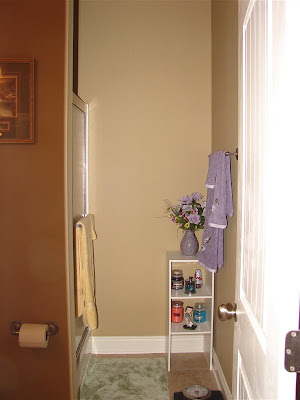 I didn't get a photo of it, but we had a built-in medicine cabinet made for her. It's built into the wall to the left of her mirror. This has worked out great for her to store her medicine in and it looks nice. Here is a view down to her shower area. She just wanted a stand up shower with a seat in it. She said she loves it. I am glad she has some more space of her own. And last, I leave you with another look down the long hallway. This time we're standing in Nana's doorway, looking down into Rachel's room. You can see the arched doorway there that leads to the kitchen. That ends our tour for today. 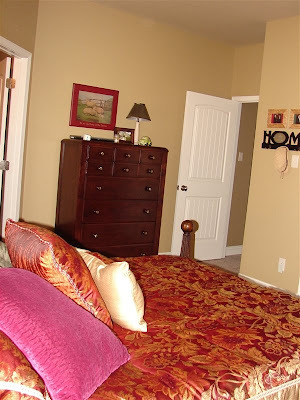 Check back tomorrow to see the girls bedrooms! !